A man in mud, Masoud Nikdel, brings his routine activities to a standstill to artistically say that water crisis is a serious problem in Iran. Masoud Nikdel, an Iranian artist who is involved in sculpture [and performance art], is concerned about water scarcity in Iran. 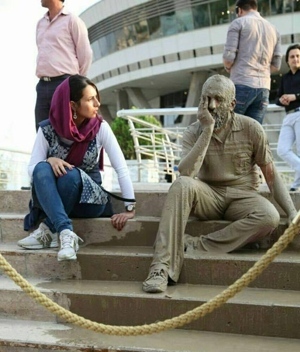 His concern took him – caked in mud – to the capital’s Milad Tower where he sat down still on the ground for three hours. 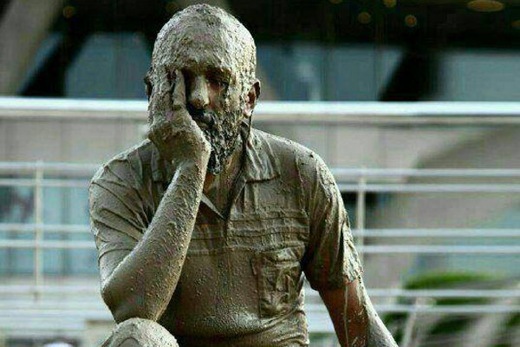 His symbolic warning was first heeded by social networking sites as images of the muddy man went viral. 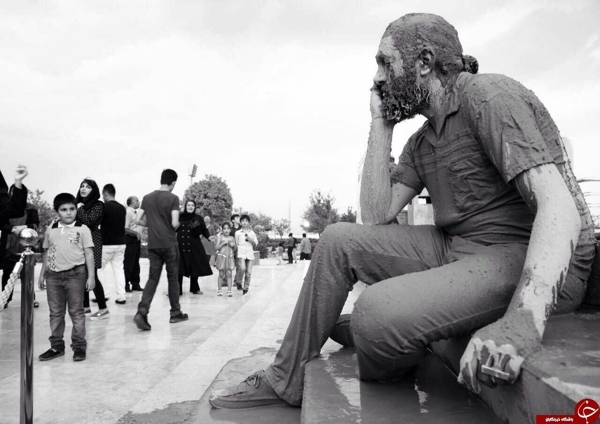 Masoud Nikdel has worked professionally on sculpture for 14 years, but his symbolic protest at water crisis was what introduced him and his art widely to the public. He set out from the easternmost part of the country – Khorasan – for the towering building of the capital to sit on its stairways for three hours. Mud-coated, he sat there with his eyes closed and his chin resting on his palm. He kept silent for three hours and left reaction by the passers-by unheeded. Nikdel is not a newcomer to art. Ten years into his professional work, he has held no exhibition, arguing that an artist should hold an expo only when s/he seeks to introduce a new style to the audience. He has experienced working on stones for which he won a title in 2000. He has also created works of art on dried tree trunks helping them remain on the city streets. He insists that trees – even if when they are dried – should not be chopped or removed from the city space. On his symbolic move in Milad Tower, Nikdel says, “The soil collected from a mountainous area of Lavasan was mixed with river water from the same area. I was blanketed with this mixture. I wanted to sit [on the stairways] of Milad Tower to go dry, but I could not stand it because of the cold breeze. I was supposed to perform [when the sun was still in the sky] but the actual performance ran from 5:00 to 8:00 p.m.
Nikdel says he will continue with this style. So we have to wait and see how he will take his audience by another surprise next time. He says, “Artists should not create a work and then say good-bye. They should keep working and reminding people. We should not force people to do something if we want to build a culture. Proper water consumption cannot become a culture by force.